Concussions May Increase The Risk Of PTSD : Shots - Health News Troops returning from Iraq and Afghanistan are far more likely to develop post-traumatic stress disorder if they have suffered a concussion. The reason may be a change in the brain's fear circuits. Charles Mayer, 30, of San Diego survived an IED attack while serving in Iraq in 2010, but has suffered from complications including PTSD. There's growing evidence that a physical injury to the brain can make people susceptible to post-traumatic stress disorder. Scientists have suspected a link between traumatic brain injury (TBI) and PTSD for many years. But the evidence was murky until researchers began studying troops returning from Iraq and Afghanistan. What they found was a lot of service members like Charles Mayer, an Army sniper from San Diego who developed PTSD after finishing a deployment in Iraq. In 2010, Mayer was on patrol in an Army Humvee near Baghdad when a roadside bomb went off. "I was unconscious for several minutes," he says. So he found out what happened from the people who dragged him out. The blast fractured Mayer's spine. It also affected his memory and thinking. That became painfully clear when Mayer got out of the Army in 2012. 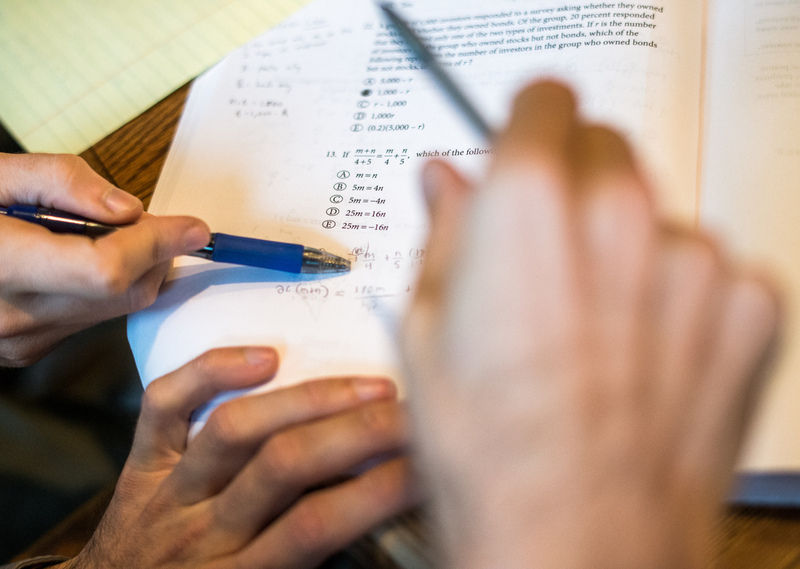 Charles (right) gets tutoring from his brother David on the GRE test at their parents' home. 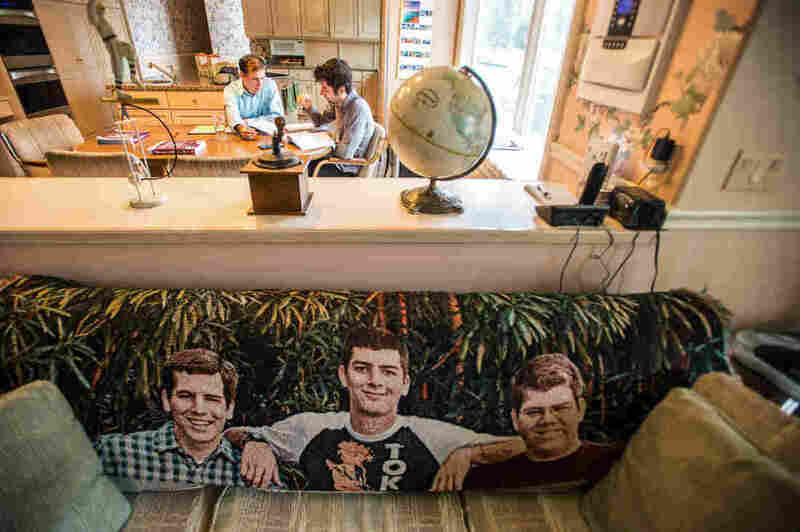 The couch in the living room bears a blanket with images of the three Mayer brothers. "Two weeks later, I started school," he says. "And a simple math equation like 120 times 7, where I previously would do that in my head very easily, I all of a sudden couldn't do that." And Mayer had a bigger problem. His time in Iraq had left him with an uncontrollable fear of improvised explosive devices, or IEDs. "When I would walk down the street, I would walk away from trash piles because that's often how they would hide IEDs," he says. "I stayed away from large crowds." Mayer's fear was not only disturbing, it was disabling. 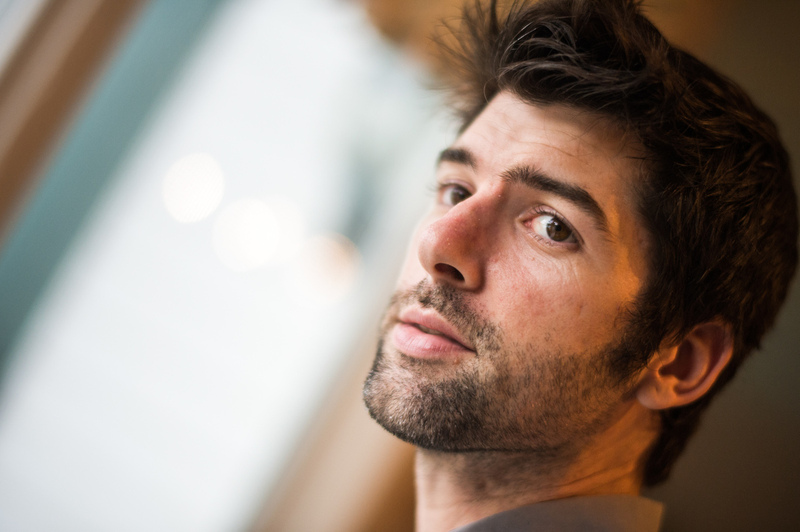 "I would get severe panic attacks to the point where I would have to go to the hospital," he says. "I would feel like I'm actually having a heart attack." Eventually, Mayer went to a Veterans Affairs hospital for help. An exam confirmed that he had PTSD. The wars in Iraq and Afghanistan have produced thousands of Charles Mayers. First they got a concussion from a bomb blast. Then they got PTSD. "We had people who were looking very miserable when they came back," says Dewleen Baker, a psychiatrist at UCSD and the VA San Diego Healthcare System. Baker kept asking herself: Was the PTSD just from the emotional trauma of combat? Or did a concussion alter the brain in a way that amplified fear and anxiety? "I could easily diagnose the PTSD," she says. "But I found it very, very difficult to tease apart the contribution of traumatic brain injury." 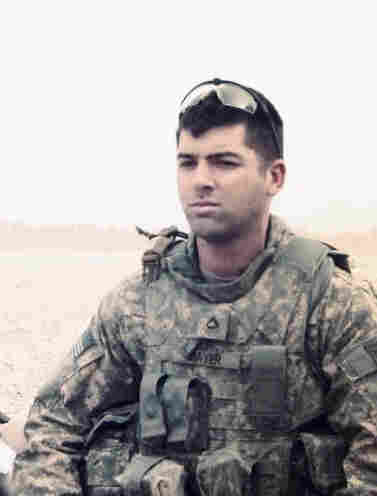 Mayer in Iraq in 2010, where he served as a sniper and was injured in a roadside explosion. So Baker and a team of researchers began studying more than 1,600 Marine and Navy service members from Camp Pendleton, in San Diego County, Calif. The service members had been assessed before deploying to Iraq or Afghanistan, and then again three months after returning. "At one point we got this battalion that went to Helmand province in Afghanistan, and literally 50 percent of them were complaining of blast exposures and symptoms," Baker says. "I got concerned." Baker had reason to worry. The study found that troops who experienced a traumatic brain injury were twice as likely to develop post-traumatic stress disorder. But why? There was no easy way to answer that question in people. But several years ago some answers began to emerge from animal studies. In one experiment, a team of scientists at the University of California, Los Angeles compared healthy rats with rats that had experienced a traumatic brain injury. All of the rats received a type of behavioral conditioning known to induce fear. They found that fear response learned by the animals that had experienced a TBI was much greater than it normally would be, says Michael Fanselow, a psychology professor at UCLA and an author of the study. Next, the team looked at cells in the amygdala, a part of the brain that takes sensory information and decides whether to be afraid. They found changes that would amplify the animal's response to a frightening experience. "And we think that that's the way TBI has of increasing your susceptibility to post-traumatic stress," Fanselow says. If brain injuries really do change the brain's fear circuitry, there should be some way to detect that change in people, says Baker. So Baker teamed up with her colleague Mingxiong Huang, the biomedical physicist. Huang has been using a technology that measures electrical activity in the brain. It's called magnetoencephalography,or MEG. Huang and a team of researchers used MEG to scan the brains of 84 people who had experienced a brain injury. Some of the participants were service members, some were civilians. Those scans found abnormal signals coming from the brains of people who'd had a concussion. And the location of those abnormal signals suggested that there was too much activity going on in the amygdala and not enough in an area that normally tempers emotional reactions. The result is a brain that is "like a car with no brake," Huang says. After leaving the Army and starting school, Charles discovered he could no longer do simple math equations in his head. To learn more about the brain circuitry involved in both TBI and PTSD, Dewleen Baker is expanding her earlier study of Marines. She plans to scan the brains of about 200 combat veterans, including some with both TBI and PTSD. And Baker will have help from a researcher with a personal stake in the project: Charles Mayer, the former soldier whose college career was interrupted by PTSD. After getting treatment, Mayer was able to finish his undergraduate degree in December. Then Mayer, who is now 30, started looking for a job that would let him study the problems that had affected his own brain. "I looked up the psychiatrists that were doing research that I really cared about, and Dr. Baker was definitely up there," he says. And Baker hired him. Their research will focus on veterans. But the findings could also help identify civilians who've suffered a brain injury that could make them vulnerable to PTSD. In a previous Web version of this story, Mingxiong Huang's first name was misspelled Minxiong, and Michael Fanselow's first and last names were transposed.